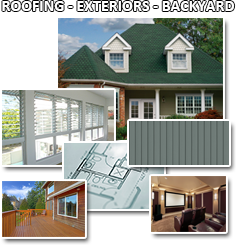 Welcome to Northstar Roofing, Fencing, & Gutters's online home. NorthStar's operation managers each have over sixteen years of experience in the field of construction. We are continuously educating ourselves on the latest products to provide our customer's the best materials and options for energy efficiency. At NorthStar we use advanced measuring techniques to ensure precise and accurate marterial orders; thus, reducing overage cost to the customer. Because of our manager's construction and building backgrounds, we take pride in handling all phases of home remodeling whether from secondary damage due to a roof leak, requests for energy efficiency upgrades, to full remodeling projects. Northstar Roofing, Fencing, & Gutters helps to make home improvement projects less stressful and more convenient. We will assist you through every step of your project. ADDING A NEW FENCE CAN REALLY CHANGE THE LOOK OF YOUR OUTDOORS. Traditional and timeless. Sleek and strong.